This site is dedicated to Dr. Ken Connolly and to the Lord he so faithfully loved and served during his many years of ministry. From his brilliant mind there has flowed a stream of messages, books, and videos to educate, uplift, encourage, and exhort people everywhere. I had the privilege of working with Dr. Connolly in the early 80's when I was a young man. 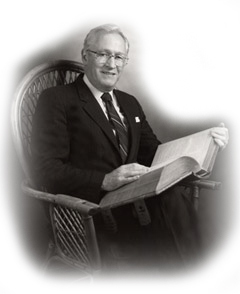 I benefited greatly from his ministry, and he continues to be an inspiration and role model for me. I had the blessing of visiting with Dr. Ken one last time just two weeks before he passed away in October 2005. He is greatly missed. Some of Dr. Connolly's better known works are available from different places on the Internet, but many of his works are unavailable, out of print, or hard to find. My desire and goal for this site is to build a comprehensive library of all of the available works of Dr. Connolly in audio, print, and video media, and to make them available to the public. I would especially like to thank Ken's wonderful wife, Carolyn, for being so helpful in answering my many questions and giving me access to Ken's library. I would also like to thank other friends and supporters, including Ken's children, and Jim Johnson. They are all a vital part of this ministry. I will never forget this humble man who "condescended to men of low estate" and was always so appreciative of the smallest thing I would do for him. May God continue to use Ken's ministry to touch the lives of people with the Gospel - the Good News - of Jesus Christ.